June 2018 Minutes reviewed and motion to adopt was passed and seconded. Dave Dye – Chair – Welcomed everyone and made introductions of Administration. Student Council Update – two representatives made a gave a brief introduction, and let us know things were just starting up for the year. Treasure’s Report – see attached report – June report was reviewed, and a motion was to adopt and was passed and seconded. – No school sponsor requests were received. Dry Grad meeting will be announced later in September and held first week in October. James Morton, VP will be steering the committee. All position were made my acclamation, and passed. – All Candidates (School Trustee candidates only) Meeting Oct 2 or 3 at Byrne Creek – former DPAC Chair and Burnaby Mountain school parent, Jen Menzi will be running for School Trustee. Parent Ed- Will continue to build on last years success, looking to do a couple speaker events this year. Q & A – What is tutorial days / Collaboration? Grade 8 & 9 sign up for different areas of interest. Grade 10 -Study block with designated peer tutors or working with community of schools mentoring. Grade 11 – working on Career Life Connections with Careers teachers. Grade 12 – working on Grad transitions or independent study. I am hoping you can direct me. I wanted to purchase additional items for the Samosa & Chutney fundraiser but it is no longer in my cash online as I have already made an initial purchase. Is there a member I can contact directly to add on to my order? 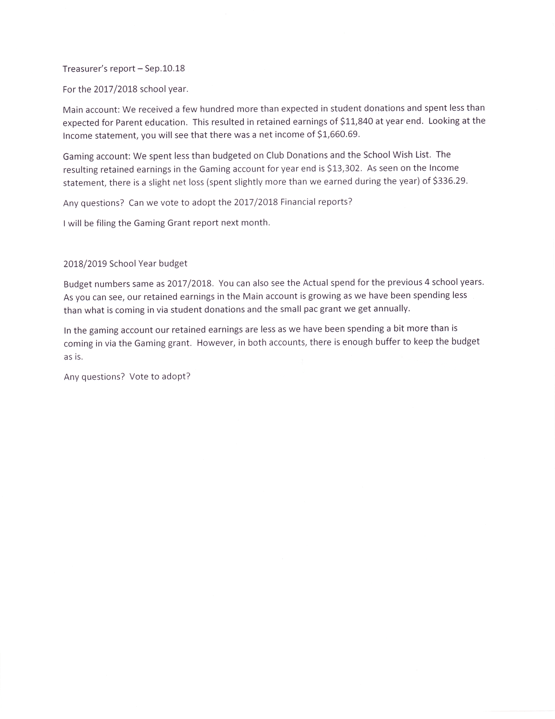 The school admin team can arrange payment for additional items. The PAC doesn’t handle payments at all.